I am wrapping up Cate’s Tour today!! Daisy Buchanan and her husband Joe have retired to Millbury, Pennsylvania. Daisy has opened Sometimes a Great Notion, a unique shop the sells vintage sewing notions, toys and jewelry. You will find her and Joe at every auction and estate sale in the area looking for merchandise to sell in her store and add to his vast antique collection. They quickly became friends with Angus Baskstead, a local auctioneer. Angus takes Daisy under his wing and they are soon traveling all over searching for treasures in other people’s trash. Sometimes searching through barns full of junk and finding amazing things. When Daisy and Joe arrive for one of Angus’s auctions they are shocked to see him being led away in handcuffs. One of his drinking buddies has been found dead and Angus is not only the prime suspect, he has already been tried and convicted in the court of public opinion. The police believe they have their man and that’s that. Daisy just can’t believe this man is a murderer. She gets a notion all her own. She is going to stitch the clues together and catch the real culprit. Cate Price is off to a great start with this series. First books in a series are hard because you have to introduce the characters and give them enough depth so that the reader is engaged but not too much because there are more installments to come. They also have to give the reader a mystery with substance to keep those pages turning. Price has done both in this book. Daisy is a retired schoolteacher who is definitely not ready to slow down. She is probably busier now than in all the years prior to retiring. Joe is more laid back and easy going but he wishes his wife was around more and spent more time with him. Any couple that retires knows there are compromises and adjustments to be made to reach a perfect personal balance. Their daughter arriving home with a furry friend adds just what the story needed to draw me right in. Too funny how Jasper seemed to live at our house a few years ago so I could truly relate. The plot of the mystery was very clever with many more suspects than just poor Angus. I was so glad when Detective Tony Serrano came to town but I don’t want to ruin the story so I will say no more. 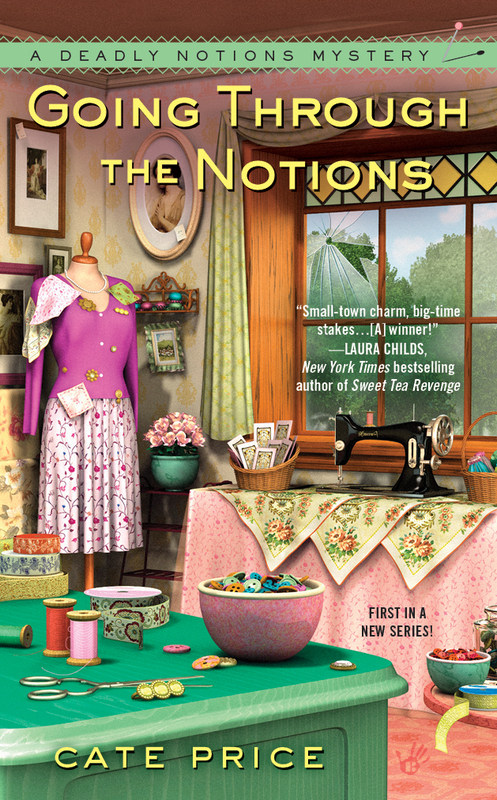 Cozy fans there’s new author in print and you are going to love her stories. Small town charm, quirky characters, a dose of humor a bit of romance and murder. Just the way we love them!! and I am adding my review copy so 2 copies are up for grabs! Plus be sure to enter the Special Rafflecopter Giveaway too! Sounds like a great book to start this series. Thank you for the review. I can’t wait to read it. I LOVED Cate’s book. It’s sitting on my “keeper” shelf, ready for another re-read whenever I need a great escape. Going Through the Notions is a mystery with a TON of heart. You’ll fall in love with all the characters – I can’t wait for book two!! Sounds like a terrific way to start a new series! 1st – I hope this isn’t a duplicate entry — sometimes I can’t remember, but since I hadn’t yet commented, I’m thinking I haven’t filled out the form earlier. 2nd – Cate, I am looking forward to read the debut novel of your new series. It’s only been this summer that I learned the description ‘cozy mystery’, but I knew immediately what it meant. I believe your Deadly Notion series is going to be a real good representation. And, Dollycas, thanks for your thoughts. Wonderful a new series of Cozy Mystery can’t wait to start. I would love to shop in your fictional store. How fun it would be. Good book.